Summer really is the perfect time to visit Stratford-upon-Avon. Located on the banks of the River Avon, this quaint market town has more than 800 years of fascinating history and is of course the birthplace of William Shakespeare. Shakespeare may have gone to London and made his fortune in the capital but he still held strong links with his home town and he even bought a property in Stratford. These days, the town is a thriving community and a great place to visit with friends or family. A cottage holiday in Stratford-upon-Avon would not be complete without a visit to Shakespeare’s Birthplace, where you can see the actual house that the famous playwright was born and raised in. The house is a shrine to those in love with Shakespeare’s work but it is also a place where you can learn a great deal about the man himself. Other famous writers such as Thomas Hardy and Charles Dickens have visited the house down the years so you will be following in some pretty impressive footsteps when you walk into Shakespeare’s Birthplace. 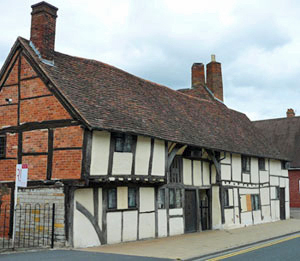 There are also a whole host of other historical buildings that you can visit such as Hall’s Croft, which was the home of Shakespeare’s daughter, Anne Hathaway’s Cottage, where Shakespeare’s wife was raised, Nash’s House and New Place, where Shakespeare lived up until his death and Mary Arden’s Farm, the childhood home of Shakespeare’s mother. What makes Stratford-upon-Avon such a fantastic place for Shakespeare fans is that you can truly go on a pilgrimage to the great man. With so many of his homes, and his family’s homes, still in such great condition, you can really get a sense of what Shakespeare’s life was like in the town that he held so dear. Once you have learned all there is to know about William Shakespeare and his life in Stratford-upon-Avon, it is a great idea to get yourself down to the Royal Shakespeare Theatre so you can see one of the shows that made Shakespeare such a national institution. The world famous Royal Shakespeare Company are constantly putting on fantastic productions featuring some of the country’s best actors and it is a wonderful way of seeing how significant Shakespeare’s work still is today. Away from Shakespeare, Stratford-upon-Avon also has many other attractions to offer its visitors. The town center is packed full of superb restaurants and bars while there are also many independent shops where you can find some real treasures and presents to give to family and friends back home. The Canal Basin is located between the Royal Shakespeare Theatre and the main shopping areas and is where you can go on a lovely sightseeing boat tour of the town. The surrounding gardens and open spaces are lovely places to have a picnic and enjoy the summer sun. Take a look at our selection of self-catered country cottages in Stratford-upon-Avon and enjoy the holiday of your dreams. Staying in a self-catered cottage will allow you to take advantage of the local produce available in the town, as you can cook up some fantastic meals for you and your guests in your very own kitchen. Shall I compare thee to a summer’s day? Thou art more lovely and more temperate. That is certainly apt when it comes to describing the beautiful town of Stratford-upon-Avon.